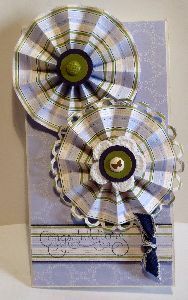 Make a fan fold flower to adorn your next handmade greeting card or gift box. "Flowers seem intended for the solace of ordinary humanity"
A fan fold flower is based on such a simple process. You cut a strip of designer paper and begin pleating it into an accordion fold, but wait. Perhaps I should start at the beginning. First, cut two 12"(20cm) x 2"(4cm) strips of designer series paper. Punch one edge of the strips with your decorative border punch. If you like, make a smaller pleated and accordioned strip to add to the centre of the bloom as a contrast or just to have a layered effect. Simply stack the smaller, completed, folded and scored circle on top of your original circle. The next step will ensure the two layers stay together. Your rosette might get away from you at this stage and spring out of your hands but you can always gather it back in again. We always have a few giggles in classes when people lose their rosettes! Quickly adhere your prepared scallop circle to the back of your bloom and then turn it over to its right side. Fill the centre or the rosette with Crystal Effects and add the straight shanks of your brad or button to the centre (you will need to have a thread through your button to anchor it in the Crystal Effects) then use a heavy object such as your border punch to weigh it down while the glue cures. Alternatively, use a Hot Glue Gun to do this part. If you add glue to a silicone mat and press the flower into the glue, the middle adheres almost immediately and stays flexible. 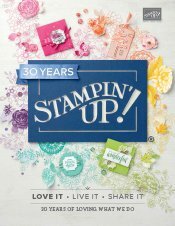 Now use your rosette to adorn a card or gift box. These flowers were made with shorter strips of designer series paper so they look more open and sit a bit flatter when completed.